Tag Archives: Goodbye Paleo – Hello Keto? Goodbye Paleo – Hello Keto? 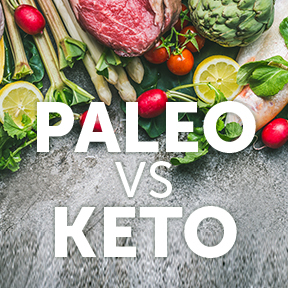 Posted on February 1, 2019 | Comments Off on Goodbye Paleo – Hello Keto? Ever since the first paleo diet cookbook was published more than 15 years ago, the paleo diet has remained popular among a small segment of the population. Although some suspect the diet has a disproportionate cultural influence, those that follow this stone age style diet are quite passionate about its benefits. The basic premise of the paleo diet is to consume only foods that our hunter-gatherer ancestors would have eaten. Proponents hold that early humans led a healthy existence for a million years or more and propose that modern humans can also thrive on caveman-era foods to promote wellbeing, increase energy and support an optimal weight. The paleo diet may be an acceptable antidote to the unhealthy western diet, but some find it restrictive, time consuming and difficult to follow long-term. The diet includes plenty of protein and fiber, so one should feel satiated and full without consuming excess calories. This pre-agricultural revolution diet includes grass fed animal meats, fats and organs; seafood and shellfish; tree nuts, seeds and wild rice; fruits or wild berries; vegetable roots, leaves and stems; honey; a variety of mushrooms; birds and eggs; insects; water and likely herbal teas. The diet excludes whole food groups including dairy, legumes and cultivated grains; as well as sugar and salt. As our hunter-gatherer ancestors were always on the move, at least 150 minutes of moderate intensity exercise weekly is recommended along with the paleo diet. Highly touted for weight reduction, the keto diet ranked second for “Best Fast Weight Loss” in the U.S. News and World Report annual “Best Diet” rankings. The goal of the keto diet is rapid weight loss, satiety, fewer cravings, and better mood, along with increased energy and focus. Studies suggest there are some advantages for short-term weight loss as well as beneficial health outcomes. Essentially a very low-carbohydrate, adequate protein, high-fat eating plan, the idea to is to fill up on healthy fats, while slashing carbohydrate consumption to safely enter a metabolic state of ketosis. When in ketosis, the body breaks down both dietary and stored body fat into substances known as ketones, an alternate energy source. Other than glucose derived from carbohydrates, ketones from fat are the only fuel the brain can utilize. Contrary to the paleo diet, the keto diet is high-fat, not high-protein. The diet would typically average 75 percent of calories from fats, 20 percent from protein and only 5 percent from carbs. For an average 2,000 calorie daily diet, this means fewer than 25 grams of carbohydrates and a limit of 100 grams of protein per day. Highly restrictive, the keto diet eschews most fruits, potatoes and other starchy vegetables, beans, bread and flour products, sugar and most grains. You can eat all the pasture-raised eggs you can consume and small amounts of unprocessed, grass-fed meats and wild caught fish. The balance of the diet consists of high amounts of healthy fats such as olive oil, coconut oil and butter, high-fat dairy, and small amounts of nuts, berries and vegetables grown above ground. Studies have shown that the ketogenic diet can successfully reduce body weight and body mass index without any significant side effects. The keto diet is not new in neurological medicine, as its therapeutic benefits notably reduce hard-to-control seizures in children. As both diets are extremely restrictive and difficult to adhere to over the long-term, it would appear neither diet would constitute a life-long healthy eating plan. And while the popularity of the paleo diet has waned and interest in the ketogenic diet has soared, perhaps following the consumer friendly Mediterranean diet pyramid guidelines would not only support overall wellness but would allow a calorie conscious person to enjoy most foods. Ranked “Best Diet Overall” on the U.S. News scorecard, the diet includes limited amounts of red meat, seafood of all kinds, a large variety of fresh produce, whole grains, healthy fats like nuts and olives, as well as a daily glass or two of red wine. I know which dietary plan I’m choosing! Comments Off on Goodbye Paleo – Hello Keto?